Burnley tickets are available for all of their matches this season in the Premier League, FA Cup and Carabao Cup at Turf Moor and afar. The club have firmly established themselves in the Premier League following their promotion back to the top flight in 2016. The Clarets have found themselves challenging for European places and despite having one of the smaller squads in the league, they are a tough nut to crack and are a well drilled team. Burnley offer a stern test for even the best of teams when they visit Turf Moor and with a squad of international talent which builds itself upon a watertight defence. Fans can bag themselves a bargain with Burnley tickets this season, however the high profile games sell fast and prices can be more expensive. However, if you miss out on Premier League tickets to watch the likes of Manchester United, Liverpool and Manchester City at Turf Moor, why not take a look at tickets for the return fixtures later in the season at venues like Old Trafford, Anfield, Etihad Stadium and many more big games with designated 'Away Section' seats! The Lancashire based club are one of only five teams to have won all four divisions in English football and they are currently playing some of the best football in the club's history. An unexpected 7th place finish in 2017/18 was the club's highest league finish since 1974, qualifying for european competition for the first time in 51 years as they entered the qualifying rounds of the UEFA Europa League. Burnley posess a huge local following and regularly sell out for their home and away matches througout the season. Tickets can be in high demand for various matches so customers will need to move quick to secure their tickets online at Football Ticket Pad. As Burnley's reputation continues to grow in world football, so does their fan base. Football Ticket Pad is an active tickets platform operating across the world and Burnley tickets in the Premier League can give fans a real taste of English football. Having trouble finding your Burnley tickets? Contact us today and a member of our team will help you find the tickets you need. All of Burnley's matches are listed below and fan can simply click on the fixture with a list of all available tickets to choose from for each particular match. Turf Moor is a old traditional English style ground which holds over 22,500 fans. It has been the home of The Clarets since 1883 and is full of history and character. The stadium did undergo a revamp in the mid 1990’s to the two tiered Jimmy McIlroy Stand and James Hargreaves Stand. 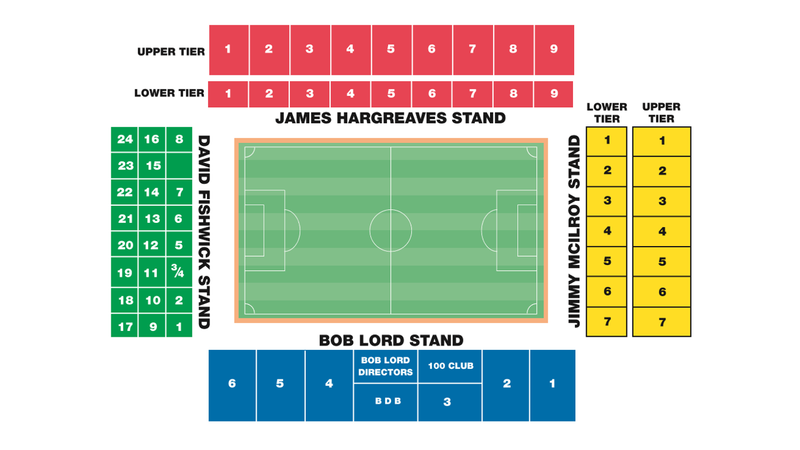 However, the dated David Fishwick Stand and Bob Lord Stand are both single tiered. Longside Upper: Seats in the upper tier of the James Hargreaves Stand which runs along the touchline at Turf Moor. The stands are packed in tight to the playing surface and Longside Upper seats offer a panoramic birdseye view of the action below and clear view of both ends of the pitch. Longside Lower: These are the most sought after seats when our customers are searching for football tickets. They allow fans to be close to the pitch and offer a unique eye level view of the match. Longside Lower seats at Turf Moor can be found in the James Hargreaves Stand and Bob Lord Stand. There is a possibility of a few restricted views at Turf Moor due to supporting pillars in the Bob Lord Stand. Be sure to check with our ticket advisors when booking your seats with Football Ticket Pad! Shortside Upper: Situated behind the goals it is here where fans can often experience the best atmosphere on matchdays. Shortside tickets are often the cheaper tickets and at Turf Moor they are located in the upper section of the Jimmy McIlroy Stand, above the Private Boxes and Hospitality Suites. These seats are totally unrestricted and can offer great views of the match. Shortside Lower: Regarded as the cheapest tickets available, Shortside Lower tickets are hosted in the lower tier behind the goal in the Jimmy McIlroy Stand at Turf Moor. We don’t supply many Burnley tickets but when we do be quick to snap up Shortside Lower tickets if you are after a good atmosphere without being too much out of pocket. VIP Hospitality: There are numerous Burnley hospitality tickets available with Football Ticket Pad at Turf Moor and if there is one package in particular that you are interested in, please contact us for more information. Whether it is The Hamburg Suite in the Jimmy McIlroy Stand behind the goal or the more contemporary Jimmy Adamson Suite, we will be more than happy to help you find the perfect matchday hospitality. We can also help with organising a Private Box at Turf Moor. If you are in a large group the James Hargreaves Suite is the perfect tickets housing up to twelve guests. Away Section: Tickets in the Away Section are strictly for away fans only. Away seats are obviously a restricted allocation but at Football Ticket Pad we can supply tickets for travelling supporters looking to catch their side play at Turf Moor this season. Fans are seated in the David Fishwick Stand behind the goal and because they are allocated a full stand, Burnley can be a great away day trip! Season / Members Cards: These tickets are seats which belong to current Burnley FC members and season ticket holders who have made their seat(s) available for Burnley matches at Turf Moor for Football Ticket Pad. Your cards will act as your match ticket and they will be sent to you in the post 3-4 days prior to the game. Customers will be notified once their tickets have been dispatched and all cards must be returned in a pre-paid envelope after the match. E-tickets: If you have purchased Burnley hospitality tickets you will receive your ticket in an e-ticket form which will be emailed to you by Football Ticket Pad. Customers can then present their e-ticket on their phone or tablet to gain entry to the stadium, or they can print off their e-ticket if they wish. Paper Tickets: If the tickets you have bought are paper tickets we will send your tickets on the week of the fixture so that you receive your Burnley tickets 3-4 days prior to the match. All of our tickets carry a 100% guarantee and you must present your tickets on entry to the stadium where they will be scanned at the listed turnstile. Burnley sealed their promotion back to the Premier League at the first attempt as they were crowned 2015/16 Champions in the Championship. It was a phenomenal achievement once more as Sean Dyche defied the odds and went 23 matches undefeated. However, the most impressive fact was that Dyche only used 25 players for the whole season, with Andre Gray leading the scoring charts with an impressive 25 goals for The Clarets. Despite failing to secure a win in their opening three matches, Burnley went on to lose only one of their next fifteen games which included impressive results against Sheffield Wednesday, Bolton Wanderers and local rivals Blackburn Rovers. However, following December defeats to Preston, Middlesbrough and Hull City, Burnley then remained unbeaten for the rest of the season, notching up fifteen wins and seven draws as the goals from Andre Gray and Sam Vokes propelled the Lancashire club to the top of the table to clinch automatic promotion to the top flight for the 2016/17 season.